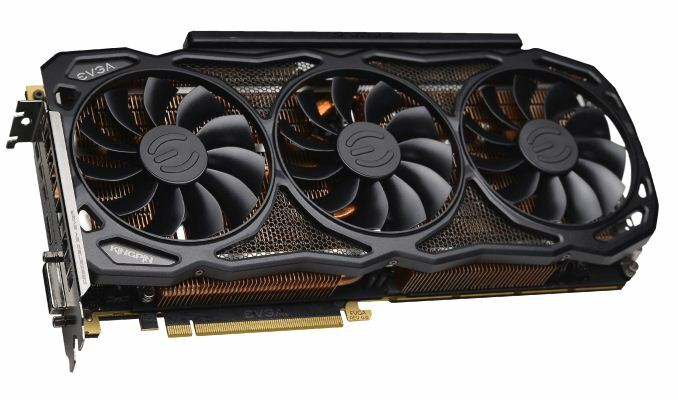 EVGA has once again collaborated with extreme overclocker Vince "K|NGP|N" Lucido to develop the new EVGA GeForce GTX 1080 Ti K|NGP|N Edition. As EVGA’s ultra-high-end overclocking card, EVGA is guaranteeing each card can be overclocked to at least 2025MHz, which means we’re looking at a binned card with a whole heap of modifications and tweaks to allow for squeezing the last few MHz out of the card. EVGA uses a fully custom PCB designed to withstand the rigors of overclocking. The card features a 15 phase digital VRM system with dual 8-pin power connectors on the right edge for better cable management. You will also find the EVGA Evbot connector next to the power connectors on the rear of the card, an interesting situation as this is a feature that doesn’t show up on too many EVGA products these days. The PCB features nine temperature sensors: three for memory, five for PWM, and one for the GPU. When it comes to display connectivity, there are three Mini DisplayPort 1.4 connectors, one DVI, and a single HDMI 2.0 port all in a row, making it possible to create a single-slot graphics card when used with a water block. The heatsink shroud has a very similar look to EVGA's FTW3 edition video card. Integrated into the black plastic shroud you’ll find three large dual-ball bearing fans pushing air through interlaced copper-plated fins bonded to six copper heatpipes (three 6mm and three 8mm) that are attached to the copper-plated baseplate. A large metal backplate spans the entire length of the graphics card, adding rigidity and structural strength to prevent it from bending under the weight of the heatsink. The card also has accommodations for LN2 overclocking. EVGA's Jacob Freeman tweeted a picture from Computex showing the GTX 1080 Ti K|NGP|N Edition running cool as a cucumber at 2404MHz. The company said the card will be available in July. No price has been announced yet. "When it comes to display connectivity, there are three Mini DisplayPort 1.4 connectors, one DVI, and a single HDMI 2.0 port all in a row, making it possible to create a single-slot graphics card when used with a water block." Kind of crazy how we're already this close to GPUs being shipped at 2GHz clocks. Not that long ago, a GPU hitting 1GHz was kind of a big deal. I'm thinking hitting 3GHz clocks should be foreseeable in the near future. I don't know, perhaps finfets are the reason for the clock frequency boost. It might take another technology shift to further control leakage to reach 3 GHz. NVIDIA had already released a GPU (GTX 550 Ti) with a 900 MHz core frequency on a 40 nm process back in March of 2011. 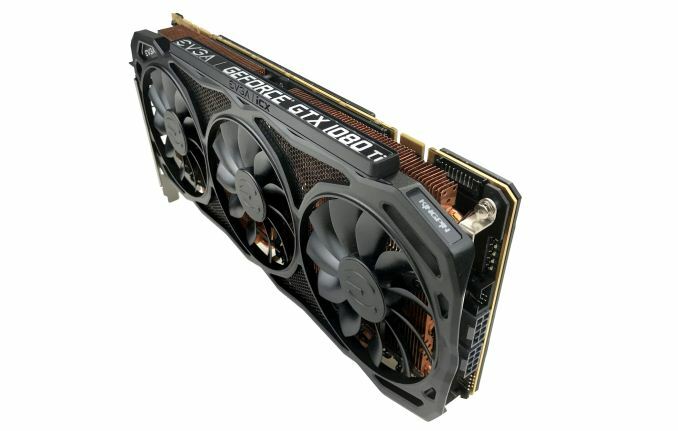 In January of 2015, almost 4 years later, on a mature 28nm process the GTX 960 was released with a 1127 MHz core rate. 16 months later NVIDIA released the GTX 1080 with a 1607 MHz core clock frequency on a 16 nm FF node. We know they can achieve clock rates significantly higher than this without hitting a a power cliff if they are willing to be a bit less efficient. Maybe they can flatten the curve out a bit more or something.